ALEXANDER DAVIDSON III was the first pastor of Mount Tabor church, and considered the first preacher that settled between Green and Barren rivers. He was active in gathering the first churches in that region, before any other preacher settled there, as well as afterwards. He must have been a man of considerable prominence, as he represented Warren county in the convention that formed the second constitution of Kentucky, in 1799. First: We believe in one only true and living God and that their are three persons in the God-head, the Father, son, and Holy Spirit. 2nd. We believe that the scriptures of the old and new Testaments, are the word of God, and the only rule of faith and practice. 3rd. We believe that we are saved by grace thro faith, and that not of ourselves it is the gift of God. 5th. We believe in mans impotency to recover himself from the fallen state he is in by nature. 6th. We believe that sinners are justifyed in the sight of God only by the imputed righteousness of Christ. 7th. We believe that the Saints shall persevere and never finally fall away. 8th. We believe that baptism and the Lords supper are ordinances of Jesus Christ, and that true believers and them only are the fit subjects of these ordinances, and we believe that the true mode of baptism is by immersion. 9th. We believe in the resurrection of the dead and universal judgment. 10th. We believe the punishment of the wicked will be everlasting and joys of the righteous will be eternal. Today, Mount Tabor Baptist Church, one of the oldest active churches in Barren County, celebrating 220 years of continuous service. The church, on Dripping Springs Road, opened in 1798 with seven members, preacher Alexander Davidson and clerk John Murphy. Thanks to the 1799 Great Revival in Kentucky, the church added 60 members. It had 91 members by 1800. On Saturday November I, 1800, the Green River Association of Baptists met at the Trammel's Creek Meeting House in Green County, Kentucky. “At 12 O'clock the worship service began. Seated in the congregation were some of the most rugged yet noble men of God that could be found west of the Appalachian Mountains. These men, in the face of untold difficulties, had plunged into the howling wilderness of the American frontier, and in the face of their bitter enemies, had conquered the land for Christ. When the legal persecutions against the Baptists began in Virginia and North Carolina. where many were imprisoned for preaching and their possessions, gained by hard labor, were taken from they, they had fled into the hills of Kentucky and there suffered incredible hardships. They endured hunger, fatigue, cold, and nakedness. The only clothing which many of them could obtain was the skins of animals. And yet the scattered and homeless ones would assemble to unite their voices in singing, and praising God. They encouraged and cheered one another, and were grateful for even their miserable retreat. Many of their children sickened and died from cold and hunger, yet the parents did not for a moment think of yielding religion. They praised the love and favor of God far above earthly ease or worldly riches. "If there ever was a religion that functioned during the week-days as well as on Sundays, it was the type found among the pioneers." Present were such men as Robert Stockton who was "said to have been thrust into jail at one time 'for preaching the gospel' " and William Matthews who, for religious sake, was almost drowned by wicked men while on his way to preach. Also present was Richard Skaggs, one of the old "Long Hunters" who had explored Kentucky with Daniel Boone, and blazed trails to lead settlers there. He was a man who knew how to survive in the wilderness surrounded by fierce animals and warring Indians. Others included Rev. Benjamin Lynn, for whom No-Lynn (Nolin) River was named. His knowledge of Indian wiles and of the wilderness ways had saved many a settler's life. He had performed the first baptism in Kentucky, in the waters of Nolin River, while men armed with rifles had guarded them against the Indians, which were lurking in the surrounding forests. Many of the old soldiers of the Revolutionary War were present. Such men as Jonathan Cowherd, who participated in the Battle at Great Bridge near Norfolk, Virginia; Philip Crowder, who was with George Washington at Yorktown and saw the British commander hand his sword to Washington when the war ended. Abraham Harding, who served in Capt. Shin s Company in Pennsylvania and came to Kentucky to assist the recovery of his sister from the Indians; and many others whose countless acts of valor would fill a book of this size. One writer said "I have seen a rural audience in those backwoods, made up of men and women of strong nerve, and not to be moved by any story of pain, danger, or death, weep with the deepest emotions as, the pioneer preachers of that day, told of the struggles of their souls in the days of their conviction and conversion." After the worship service began, Elder Carter Tarrant delivered the introductory sermon from Psalms 55:14, "We took sweet council together, and walked unto the house of God in company." 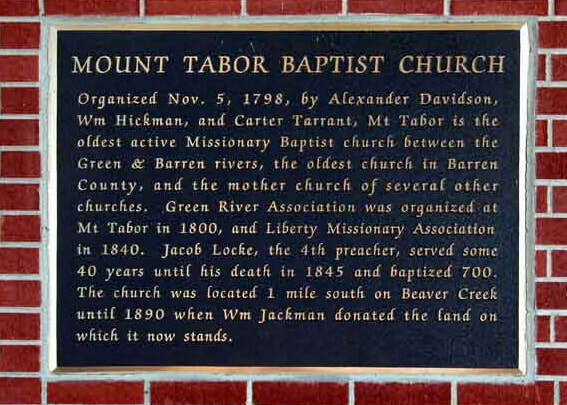 Elder Tarrant had helped constitute the first Baptist Church in present Barren County, Kentucky in 1798. He was later called to the pastoral care of this church (Mt. Tabor). As early as 1796, he had been a member of the Tates Creek Association (the first United Baptist Association in Kentucky) when they appointed members of the clergy "to visit the destitute brethren on Green River with their ministerial labor " Brother Tarrant died during the War of 1812. He was a number of years pastor of Sinking Creek church, in Warren county, which was probably gathered by his ministry. He was a laborer among the churches of this region, as late as 1823. SINKING CREEK church was located near a stream from which it derives its name, near the south-western corner of Barren county. It is one of the first three churches gathered in the region of country lying between Green and Barren rivers. It was constituted sometime during the year 1798. The first convention that met to consider the propriety of organizing an association in this region assembled with this church, the second Saturday in June, 1799. Alex. Davidson was its first pastor, and had membership in it. This church was one of the nine of which constituted the Green River Association, in June 1800. It shared largely in the great revival. Forty-two members were added to its roll by experience and baptism, in 1802, and it reported that year, an total membership of 142.